Bringing your newborn baby home is one of the most important steps in building a family. You have all the pieces in place to start building towards the future. However, you have to make sure your present situation is capable of supporting your future. Parents worry endlessly about how to protect their children from the outside but many forget the fact that children often face many hazards within their own homes. Here are a handful of tips that all future and current parents should consider implementing to make sure their homes are optimised for their children. A large proportion of baby related injuries are related to falls and collisions with furniture. Babies and small children might get the idea to climb on top of furniture so making sure your furniture is away from windows is an important childproofing tactic. Adding simple, inexpensive items like cushioned corner guards go a long way in preventing injuries to the little ones. Also, make sure you bolt clunky items such as dressers and bookshelves to walls to minimise the possibility of them toppling over. The problem with carpet is the number of dangerous items that can be hidden in the fibres. That ‘new carpet’ smell is made up of volatile organic compounds such as toluene, benzene and acetone that aren’t good for adults, let alone children. Old carpet has had years to fester with dust mites, dirt and all the other toxins acquired from the outside. Opting for floorboards is a much more hygienic option for all residents. Also, kids have a tendency to get messy and surfaces such as hardwood timber flooring and laminate flooring are low maintenance floors that are perfect for families. Electrical outlets are an unavoidable hazard present in all homes. Plugin caps are easy fixes but they can be removed and placed in your child’s mouth. Replacing the outlet covers with sliding safety latches is the more optimal strategy. 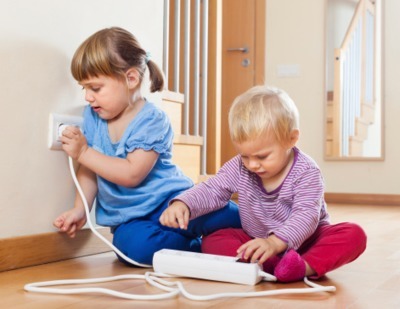 Make sure your cords are out plain view and use electrical tape to secure them from your child. The kitchen, the laundry and an unsupervised pool are no places for your baby. Installing gates and fences to keep them out of peril and to keep them in one place is key to a child-friendly home. Look for gates that your child won’t be able to dislodge or wedge their ways through. Whilst all these child proofing strategies are well and true, childproofing your home is a dynamic process and changes as your child grows up and gains new skills. Be wary of new hazards that emerge as your child learns to climb and walk. Consult professionals if you have any doubts prior to making a decision. Did I miss anything? Feel free to leave your childproofing tips in the comments.